During the last eight weeks life has thrown me a little bit of a curve ball along the path of my ME journey. 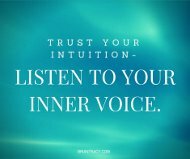 One that has taught me above all else, how important it is to trust your intuition fully and wholeheartedly, especially when it comes to your own body. I started feeling more unwell that usual at the beginning of April. I put it down to a cold that I had caught from my baby nephew. The strange thing was though, that two weeks after the typical runny nose / sore throat situation, I felt worse than when I had before. With ME its a known thing that virus’ can be a lot harder to get rid of, due to the immune system dysfunction that occurs in so many of us. But this felt different. My glands have been severely swollen, and they were popping up all over the place, from the base to the top of my neck. It got to the point where my brother said that my ‘neck looked fat’ (lovely!) My throat was, to put it frankly, a mess, covered in blisters and ulcers. I also had a high temperature for weeks on end. I’m used to poorly days. I’m used to relapses. But my point here is, these symptoms and the severity of them, as well as the detrimental effect they were having on my existing illness, wasn’t normal for me and the severity suggested more than just a normal virus. I went to the doctors about three weeks after the onset of all this, to be told it was a virus or ‘just your ME’. I accepted the virus diagnoses….to start with. I went home and continued sleeping endlessly, drinking copious amounts of hot water with lemon and waited for it to pass. I went back to the doctors, after four weeks of feeling ill in a way that was different to my ‘normal’. He was still adamant it was a virus or the ME. I’ve had ME for fifteen years, I know my own body. My intuition was screaming at me that this was something else. It felt very similar to when I had glandular fever 17 years ago and I began to wonder if it had come back? How can blood test results come back as abnormal yet you are still sent away with no answer?! I hate the way that when you have a long term illness, they automatically presume every thing you have is to do with that and shoo you away. This is how things get missed. This is how things HAVE gotten missed. If my body had suddenly started reacting so severely and it was to do with the ME, I wanted to know why? And what was going on? If it was a virus, I wanted to know why my body wasn’t fighting it? And if it was something else (which is what my intuition was screaming at me that it was) I wanted to know what?! Yet for some reason, off home I went, feeling confused and concerned and dreadfully ill. Why do we do this? Feel we don’t have the right to speak up for ourselves when it’s something as important as our health? After another week being bedridden with my symptoms just getting worse by the day, I went back to the doctor again. This time, after five weeks of being passively polite, I insisted on being referred somewhere and also asked for throat swabs to be taken. My doctor was adamant there was no bacterial infection so implied throat swabs were a waste of time. A week later my results came back. There was an acute bacterial infection in my throat, that had spread up to my ears, that had been left untreated for eight weeks. This could have been spotted on week one and treated easily then. What has actually happened instead, is that my already poorly functioning immune system, has had eight weeks of trying to fight an infection and it has, not surprisingly, triggered an unpleasant ME relapse. I’m always a little hesitant about repeatedly going back to the doctor, especially if they have already given me their opinion or diagnoses. Its clear they are already inundated with patients and this can lead to you just sitting at home waiting for things to pass that actually need medical attention. This experience has shown me how important it is to TRUST YOUR OWN INSTINCTS. If I had sat at home and waited for the ‘virus’ to pass, the infection would have spread even further. When you have a long term illness, it is not uncommon for doctors to sweep all new symptoms under the carpet, presuming it’s just due to your existing condition. This is where we need to be vigilant. Many of us presume doctors know everything, but especially when it comes to illnesses such as ME, they unfortunately, do not. Yes the medical profession have had years of training, but you are your own expert when it comes to your own body. You are the one who lives in it!